The primary objective of writing this book is to provide a platform for the beginners to get started with Arduino and its interfacing with SCILAB. 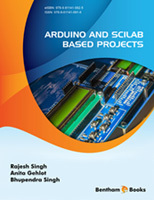 The book provides the basic knowledge of the programming and interfacing of the devices with Arduino and SCILAB. This book provides basics to advanced knowledge of Arduino and its interfacing with input/output devices (display devices, actuators, sensors), communication modules (RF modem, Zigbee) and SCILAB. This would be beneficial for the people who want to get started with embedded system projects. It provides embedded system based on Arduino with simulation, programming and interfacing with SCILAB, all at a single platform. Arduino interfacing with SCILAB with and without Arduino_1.1 packages are included. Basics of the Arduino are covered in section-A, section-B covers interfacing with Scilab Arduino_1.1 package and section-C covers projects without Scilab Arduino_1.1 package. The concept which makes this book unique is descriptions of real time project prototypes with programming and simulation of Arduino and SCILAB. This book is entirely based on the practical experience of the authors, while undergoing projects with the students and industries. Although the circuits and programs mentioned in the text are tested, but in case of any mistake we extend our sincere apologies. Any suggestions to improve the contents of book are always welcome and will be appreciated and acknowledged. We acknowledge the support from ‘Nutty Engineer’ to use its products to demonstrate and explain the working of the systems. We would like to thank ‘BENTHAM SCIENCE’ for encouraging our idea about this book and the support to manage the project efficiently. We are grateful to the honorable Chancellor (Lovely Professional University) Ashok Mittal, Mrs. Rashmi Mittal (Pro Chancellor, LPU), Dr. Ramesh Kanwar (Vice Chancellor, LPU), Dr. Loviraj Gupta (Executive Dean, LPU) for their support. In addition, we are thankful to our family, friends, relatives, colleagues and students for their moral support and blessings.